"What makes you feel closer to God?" When Christine Sine asked people this question, the answers she received surprised her. It wasn't pipe organs and pulpits that most often opened people to God's presence, but simple things in daily life. In Return to Our Senses, Christine Sine shows you how simple experiences - breathing, drinking a glass of water, walking amongst trees, shooting a photo, picking up a stone - can become "thin places" and pregnant moments in your daily life - helping you awaken to God's presence, savor God's nearness, and translate your experience of God into prayerful, compassionate action. It was written for those who hunger for a deeper, more life encompassing relationship with God. 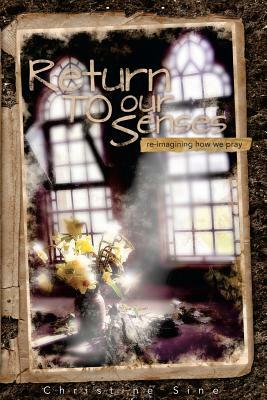 Return to Our Senses explores approaches to prayer that connect our spiritual practices to everyday life, awakening all our senses to a deeper relationship to our loving God. Some of the practices have existed for centuries and only require us to tap into the rich knowledge and practices of ancient followers of Christ to access them. Others will be newly created, springing fresh from our imaginations and creativity, specially designed for intimacy with God in our present culture. This is a great book for group study. A free study guide is available through the Mustard Seed Associates website http: //msaimagine.org.